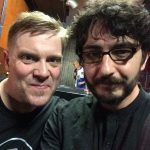 A few days ago I had the pleasure of meeting Craig Blundell at a David Cross gig. This gentleman is a bit of an inspiration for me; I’m a reader of his blog and he has always struck me as a kind, down to earth person. And I was not disappointed. Craig had to sit on a prestigious and very uncomfortable throne, which is the Steven Wilson gig. He had to fill a few big pair of shoes. Gavin Harrison, Marco Minneman, Chad Wackerman. Personally I find his drumming fresh and very musical and definitely in the same league as his predecessors’ but that’s just my opinion. The point is that, when you take that kind of gig, on top of the pressure of expectations from yourself and your band mates, you offer yourself to the collective opinion of the Internet crowd. Unfortunately, as we all know, any idiot with a keyboard, three neurons and unfulfilled dreams of success can comment on YouTube. You know what I’m talking about. The courage of the keyboard warriors who, and I will state that time and again, helped tipping Keith Emerson’s boat and pushed him to suicide by saying needless nasty stuff about him, from the high ground of their absolutely ordinary life and without any sign of kindness or respect that musicians such as Keith, or Craig, command. As an in the trenches working musician with a web presence, I too am exposed to all that crap. We are musicians, it takes loads of strength to deal with criticism. Well. Mr. Blundell showed me that it’s ok to feel vulnerable. In an age when everyone supposedly has balls of steel, he told me it’s cool to bend like bamboo in a storm and then hit back with excellence and grace. That’s not to say that he’s not thick skinned, but it’s great to see someone who is not afraid of showing his feelings in a business in which attitude is everything. Dude is the real deal. I’m blessed to be sharing my time and Music with these lovely chaps!